This photo is currently framed and mounted on the wall above my dining table and often challenges my concept of perception and the way I use my ‘lens’ to view life. I love that like music, photography and other art forms simply provide a creative means in which to express or capture emotion. 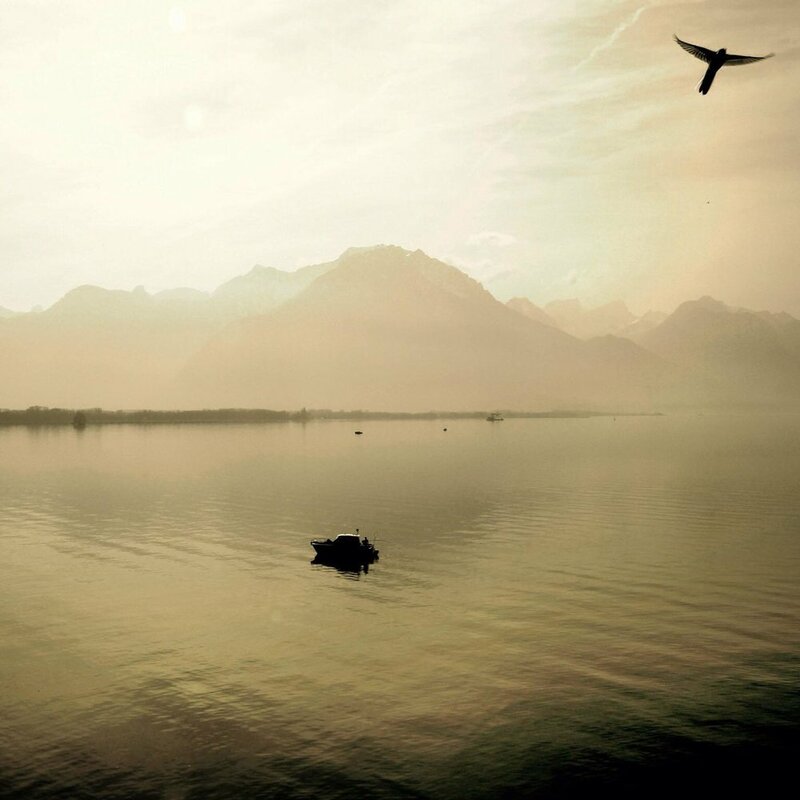 For me this photo captures not only a fond memory as it was taken on my honeymoon but also a simplicity and beauty that leans on both the vast and overwhelming presence of the mountains and lakes to the subtle detail of a passing bird. I am a very amateur photographer who took this photo leaning out of a window from the Chateu De Chillon, an old castle located on Lake Geneva in Switzerland. Whilst peering from the window of the castle, my attention was drawn to the small fishing boat that almost seemed to be swallowed by the vast lake and surrounding mountain ranges. Framing this shot was simple enough with the focal point being the fishing boat bordered by the amazing backdrop of creation. However, it wasn’t until I was back at my hotel that I realized the bird in flight in the top right hand corner of the image and I think this is why I now love the photo so much. I guess for me it has challenged my perception on how I want to view this life. Sometimes I think I really try to focus on the obvious such as the example of the fishing boat where as often in life it is the subtle details that I may not see or envisage such as the passing bird that later bring me the most joy. As we enter a new year with new goals, new directions and new challenges, don’t be afraid to challenge yourself to look past the obvious focal point in your life and create a space to be challenged and impressed by the more subtle and simple details that this life has to offer. It’s a vast world and a complex life but often it’s the small and somewhat insignificant details that help us to move forward as people. Happy New Year all and may it be one that is full of adventure and overcoming.